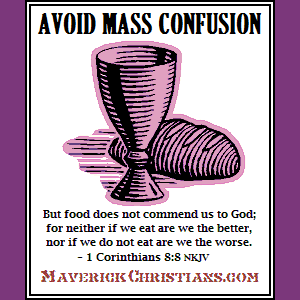 Communion bread & wine don’t change into flesh & blood. We are not saved by participating in Holy Communion. The Holy Bible does not teach cannibalizing the Christ! When Jesus turned water into wine the liquor did not retain the appearance and properties of water and tell the people it was wine. So how can you possibly believe that communion bread and wine are actually changed into the flesh and blood of Jesus Christ when they are evidently NOT changed and tell people that they are? Jesus said that He IS the bread which came down from heaven. He did NOT say the he BECAME bread or vice-versa. Jesus was using a figure of speech called a metaphor. Jesus obviously was not talking about physically eating and drinking Him, but SPIRITUALLY. The Bible passage of John chapter 6 nowhere mentions holy communion nor transubstantiation. 26 For as often as ye eat this bread, and drink this cup, ye do show the Lord’s death till he come. Holy Communion is a remembrance that shows, demonstrates and proclaims the Lord’s death. But it is not a sacrifice of Jesus Himself. The cup Jesus used in His analogy was filled with the fruit of the vine, not His own actual blood! It is the real shed blood of Jesus, not the Roman Catholic communion cup, that cleanses us from sin. Jesus was already offered for our sins. This is never to be done ever again. That means Christ is not offered through the Catholic Mass. Give up attending Mass. The real shed blood of Jesus Christ paid the penalty so that you may be forgiven of all of your sins and misconduct. Receive new life by truly believing in Him. Trust that His blood, that was already shed for you, will transform your life! The bread of life does not change.